For his birthday, Roscoe received a butterfly house. The caterpillars arrived a few days ago and were quickly named Chloe (shared by our dog), Merritt, Bug, Butterfly, and Roscoe. Roscoe is quite excited about his caterpillars and since he loves to watch video of himself and has started to demand it, this video is about Roscoe and his caterpillars. The first part is the most entertaining but without my computer I didn't edit out the rest. LOL! Oh my gosh, soooo funny! 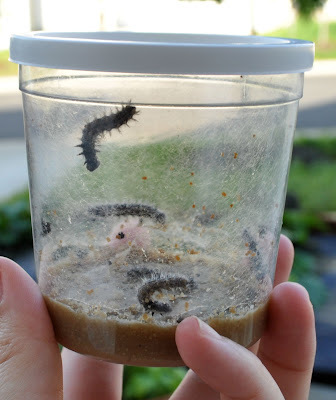 "Caterpillars live in the little tiny cup!" Hahaha! He is such a smart little munchkin! AAHHH this video just melted my heart! I miss him!